July Top of the Tree Special: Vote Now! June is here, and with it arrives a new Top of the Tree special. This time around, the mighty Super Conqueror steps into the spotlight. Make sure to make the most of it, as such great discounts and bonuses won’t be available forever! The tank featured in the current event was chosen in a special poll by you guys, the community. Now the new poll is open, and you have yet another chance to influence the next Top of the Tree special that will start on 1 July. Log into your account and cast your vote for your favourite Tier X medium tank. The poll will be active until 10 June. 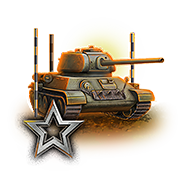 Bonuses: Discounts on vehicles belonging to the highlighted tech line, an increased Crew XP acquisition on their crews, and two special missions, available exclusively for the Tier X tank featured in the event. Vehicle voting: Special polls will be opened on our forums. Vote for the vehicle you would like to see featured in the upcoming Top of the Tree special. Voting Eligibility: Every player that has a registered account is able to vote in the polls after logging in on the forums.